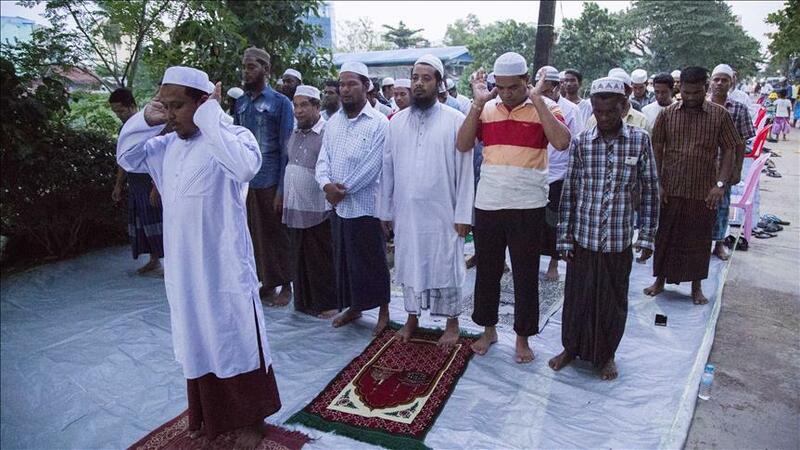 YANGON, Myanmar -- Muslim residents in Myanmar’s largest city Wednesday protested the closure of their two religious schools as they have fewer place for worship in the month of Ramadan -- the ninth and holiest month of the Islamic lunar calendar. Local authorities -- following negotiations with local Muslim leaders -- chained shut two madrasahs in Yangon city on April 28 after a mob led by ultra-nationalist Buddhist monks demanded an immediate closure of religious schools in the area. On Wednesday evening, some 100 Muslims gathered on the street in front of one of the two madrasahs to pray and protest the closure as the madrasahs stayed closed until now though the authorities said it was just temporary. Tin Shwe, the head of the madrasah, told Anadolu Agency that authorities also barred Muslim residents from worshiping in six other schools in Thakayta Township without giving any proper reasons. “We requested them to let us worship in these schools during Ramadan. But it went unanswered,” he said on Wednesday. He added local Muslims were performing prayer at their individual places such as houses and shops since the ban. “This is not the way we should perform prayers, especially in the month of Ramadan,” said Tin Shwe, adding the closest mosque was about a 45-minute walk away. Min Naung, a 32-year-old Muslim resident of Thakayta, who joined the protest, said he has worshiped in the schools since he was a child. “This is the first time we are not able to gather during the Ramadan month,” he told Anadolu Agency after the street prayer. “The ban makes us shocked,” he said. New York-based Human Rights Watch earlier this month said the closure was "the latest government failure to protect country’s religious minorities". "The government should immediately reverse these closures, end restrictions on the practice of minority religions, and prosecute Buddhist ultra-nationalists who break the law in the name of religion," said HRW’s deputy Asia director, Phil Robertson. HRW said Myanmar government has placed opaque and onerous restrictions on the construction or renovation of religious structures, as well as limits on the practice of religion, elements of the systemic discrimination facing Muslims, including the ethnic Rohingya Muslims in western Rakhine State. Anti-Muslim movements have been on the rise in predominantly Buddhist Myanmar since an outbreak in communal violence in the western Rakhine state in 2012.